Doing LEGO builds for themes that never had official sets must be the hardest. 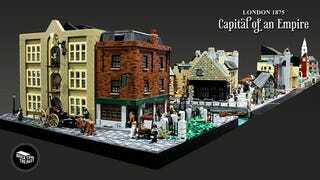 But a UK-based group called Bricks to the Past's large-scale LEGO display of 19th century London is amazing without acknowledging that. Here's the full build with the London Docklands and its warehouses on the east side and some cozy stores and scenery on the other side. That's pretty cool, but the special modular buildings and the crowded streets are just simply awesome. The department store used elements of both the Harrods and Fortnum and Mason buildings. The bank was inspired by the architecture of the Bank of England. The newspaper office, complete with printing press was modelled on the old Daily Telegraph building in Fleet Street. Finally at the top of the display sits St Clement Danes. I'm sure Jack the Ripper's lurking somewhere in a nearby alleyway.